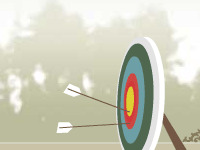 Description: The most awesome archery game on the web is back! You, the trainee Bow Master, must hone your kyudo archery skills on the eve of The Great War in Japan. Take your arrows and hit the tricky targets in the beautiful Temple Garden to become the Bow Master Japan.. Bow Master Japan is a Archery Games.